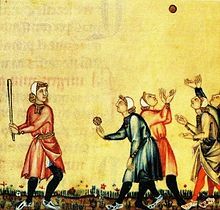 Young men playing a bat-and-ball game in a 13th-century manuscript of the Galician Cantigas de Santa Maria. Bat-and-ball games (or safe haven games to avoid being confused with club games such as golf and hockey) are field games played by two opposing teams. The teams alternate between "batting" (offensive) roles, sometimes called "in at bat", and "out in the field" (defensive), or simply in and out. Only the batting team may score, but teams have equal opportunities in both roles. The game is counted rather than timed. A player on the fielding (defensive) team puts the ball in play with a delivery whose restriction depends on the game. A player on the batting team attempts to strike the delivered ball, commonly with a "bat", which is a club governed by the rules of the game. After striking the ball, the batter may become a runner trying to reach a safe haven or "base". While in contact with a base, the runner is safe from the fielding team and in a position to score runs. Leaving a safe haven places the runner in danger of being put out. The teams switch roles when the fielding team puts the batting team out, which varies by game. In modern baseball the fielders put three players out; in cricket they retire all players but one. Some games permit multiple runners and some have multiple bases to run in sequence. Batting may occur, and running begin, at one of the bases. The movement between those "safe havens" is governed by the rules of the particular sport. Composite rules Softball-Baseball – a hybrid bat-and-ball sports which combines the elements of Baseball and Softball, played on the large identical baseball diamond with the larger ball, ten rather than nine innings, and allowing pitching the ball either underarm, overarm, or sidearm. Composite rules Baseball-Cricket – a hybrid bat-and-ball games combining elements of baseball and cricket, played by two teams of 12 players with the 9-inch diameter baseball on the oval-shaped field about 220 yards long by 176 yards wide, at the center of which is a baseball field about 92 feet apart with the rectangular 66 feet 6 inch by 12 feet pitching area roughly at a distance between the pitcher and 2 batters (consists of the striking batter and non-striking batter), equidistant between first and third base, and a few feet closer to home plate than to second base. The objective is one batter (striking batter) on and at the right batter's box is been pitch to, other batter (non-striking batter) stands on the left batter's box, then the striking batter must hit it and batter must runs around the bases in the normal counterclockwise direction, while the non-striking batter runs around bases in a clockwise direction at the same time. The game could last 12 innings of 5 overs. Striking the ball with a "bat" or any type of stick is not crucial. These games use the foot or hand. Otherwise their rules may be similar or even identical to baseball. The first two use a large (35 cm) soft ball. ^ Usually. In some games for a small number of players, such as workup and the way old cat games, there are no teams and players rotate through the positions.